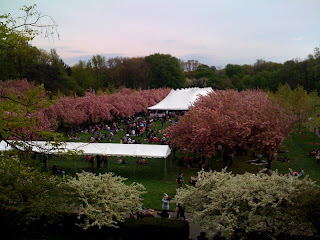 Last Saturday, we went to the Brooklyn Botanic Garden to catch the tail end of the cherry blossoms in bloom and for Sakura Matsuri, New York City's "rite of spring" (the 28th year) festival. The day started rainy and it was supposed to rain heavily all weekend. But when we got there, it was nothing but sun and warmth. 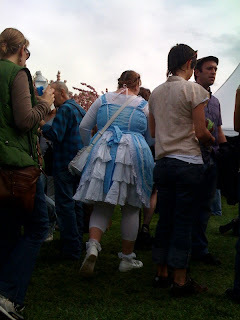 People were festively dressed to have fun, like this sassy cutie pie little one. She looked like an adorable baby yoda. 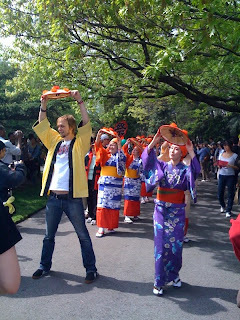 And since Sakura Matsuri included anime events, people (especially the teens) were dressed in eleborate anime costumes. We, unfortunately, didn't get any good photos of them. 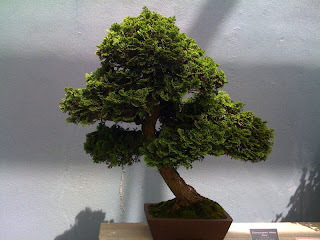 The festival included different demonstrations - origami, doll making, ikebana flower arranging, woodblock printing, and traditional tea ceremony. Marie would have had a blast. 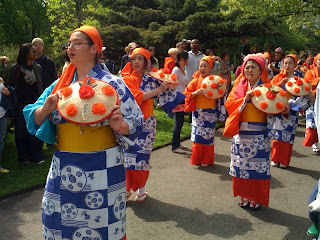 This is Hanagasa Odori (flower hat dance) procession performed by the Japanese Folk Dance Institute of New York. We wanted to take one home. You have no idea how expensive these things are. The taiko drumming was definitley a crowd pleaser. We were looking forward to seeing Bushido: The Soul of Samurai. What we wanted was something traditional, what we got was something that seemed more broadway. We skipped the overpriced bentos and had some (undercooked) burgers instead. 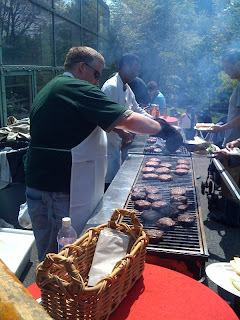 The burgers weren't great but when was the last time we had burgers beneath cherry blossoms? 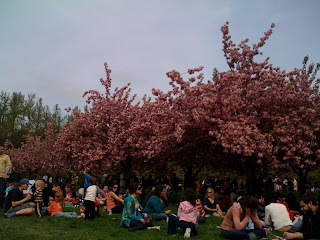 As fun as the Sakura Matsuri was, the main attraction for many people like us were the cherry blossoms. 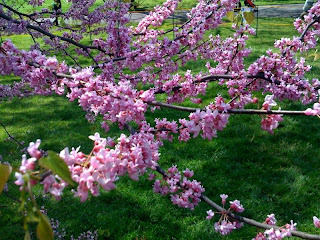 The Brooklyn Botanic Garden had 220 cherry trees. The weather was rainy and windy the entire week leading up to the weekend and we were getting that horrible feeling that the weather was killing the delicate blossoms and that we had missed our only chance. But we were blessed! 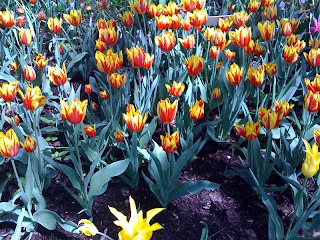 We walked into the Garden and saw rows and rows of these. It was magical. It almost didn't look real. Families and couples were taking millions of pictures. We were one of them. Everyone just looked so happy. 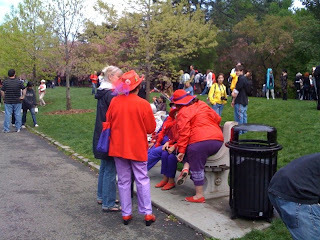 And did we mention how well dressed some folks were, like these stylin Brooklyn golden girls. We even got to see a wedding take place. It costs some dough to get married here, but it you have the money, it's worth every penny with views like this. We can't think of a better time to get married here. 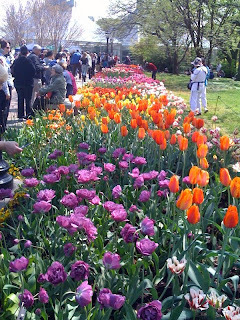 The tulip area was also impressive. 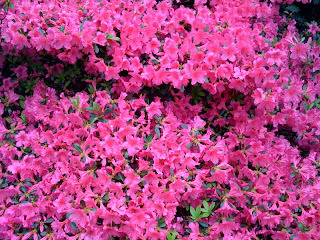 They were completely open, although some looked like they were going to die the next day. 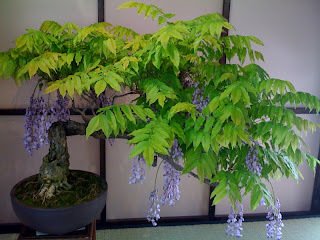 We ended our day at the Garden appropriately with sake and Sapporo under the cherry blossoms at the Cherry Esplanade. People were picnicking with their families, but it wasn't your average picnic. 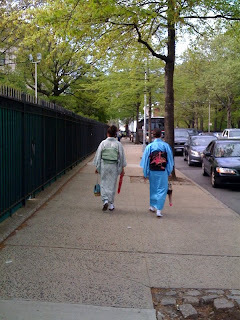 This was one of my favorite pictures I took this day - two young teenagers who weren't Japanese wearing a full traditional Kimono attire walking down the streets of Brooklyn. We love New York! 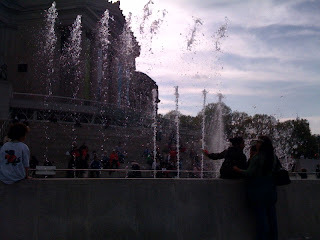 Before we got back on the subway, we bought some ice cream from the nearby ice cream truck and ate our Vanilla ice cream cone while watching kids run through this fountain in front of the Brooklyn Museum. It was a good day. It was one of those days that remind you how beautiful life and nature and people can be.